Need a Polished and Engaging Speaker? 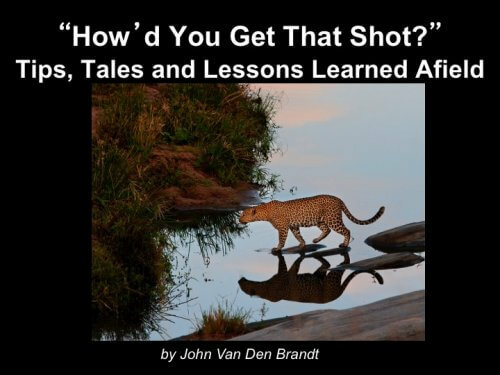 John Van Den Brandt’s breath-taking wildlife images and engaging style make him a popular speaker for keynote engagements, banquets, workshops, seminars, and school lectures. His entertaining and relaxing presentations appeal to anyone that enjoys wildlife. 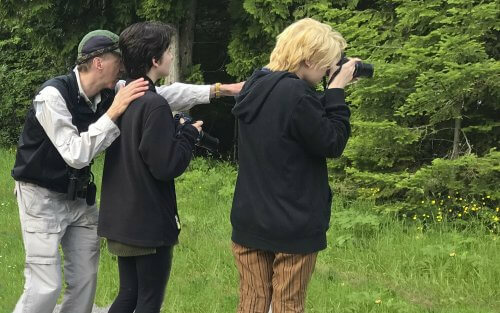 Also a gifted instructor, John’s workshops and seminars are known for reaching beyond typical, well-worn photography tips. He delves into real world strategies and field tactics for better capturing the beauty and drama of the natural world. All presentations are typically 50 minutes in length, but can be tailored to meet your needs. Please contact John for rates and availability. 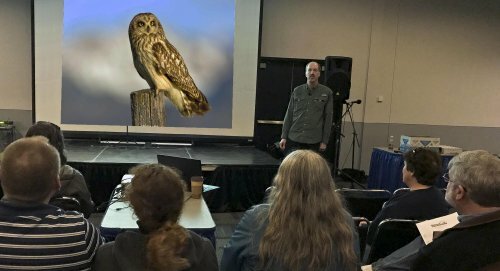 John Van Den Brandt, of Wild Wind Images, presents 20 practical tips that can be immediately employed to increase your chances of capturing that wildlife “shot of a lifetime.” The presentation is illustrated with John’s own stunning images, many of which have appeared in his nationally distributed calendars. John is known for packing loads of information into his classes while entertaining participants and illustrating his points with humor and stories from afield. Whether you’re a novice photographer or a serious shooter, you’ll leave this presentation excited to try new strategies and tips for getting closer to wildlife and creating more dramatic, high-impact images. 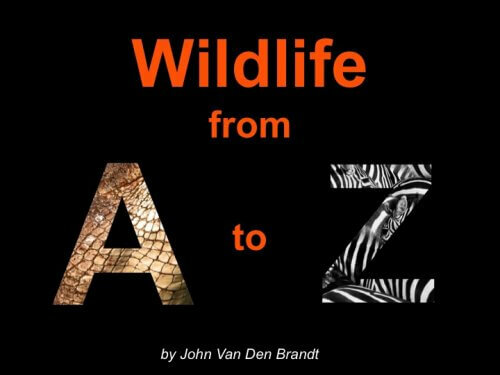 Wildlife from A to Z.
Wildlife photographer John Van Den Brandt of Wild Wind Images takes viewers on a tour of the animal kingdom, literally from A to Z, mixing his stunning images with humor, stories from afield and fascinating animal facts. From alligators to zebras, from tiny elf owls to massive orca whales, the presentation is a visual feast featuring many of John’s amazing images that have appeared in his nationally distributed calendars. This is not an instructional photography lecture, but rather an entertaining and relaxing presentation that will appeal to anyone that enjoys wildlife and appreciates the photographer’s challenging role in capturing the beauty and drama of the natural world. 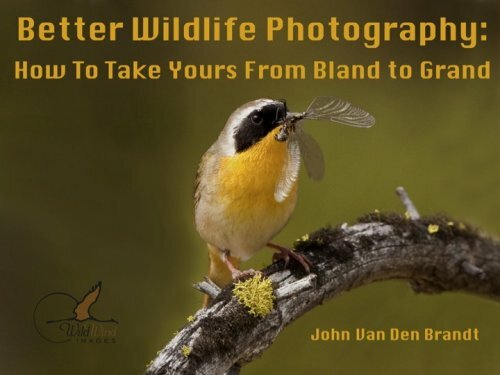 In this fast paced, information packed presentation, Wildlife photographer John Van Den Brandt of Wild Wind Images LLC answers the one question he’s most frequently asked, “How’d you get that shot? 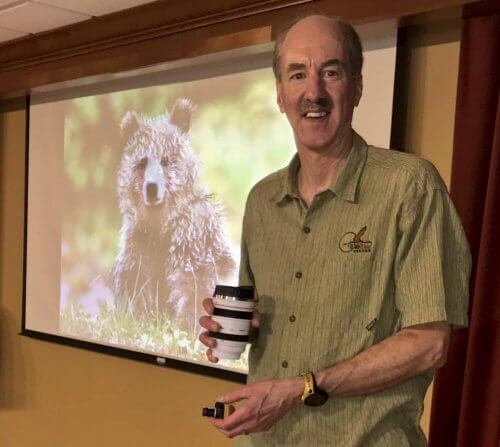 !” John tells the story behind the shots, sharing the tips and strategies employed in capturing his amazing wildlife photographs, many of which have appeared in his nationally distributed calendars. Whether you’re new to photography or a seasoned veteran, you’ll come away from this all-new presentation energized and armed with an array of practical tools and ideas for visualizing and photographing the natural world. 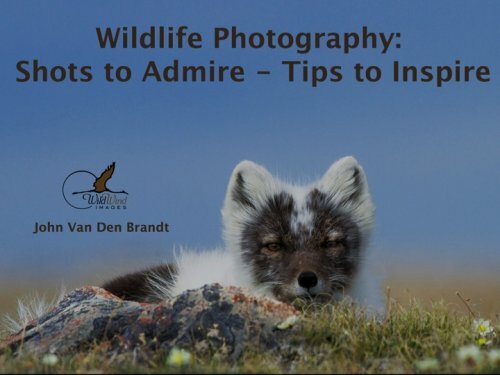 If you’re not a photographer but love wildlife, Van Den Brandt’s stunning images will leave you inspired to go out and explore your own wild places and witness first-hand the beauty and drama of the natural world. Wildlife Photographer’s Recipe for Success: Just Add Water! Improve your chances of capturing that “dream shot” the next time you’re on the water! 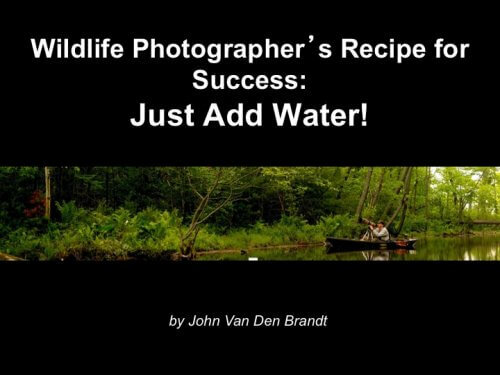 Wildlife photographer John Van Den Brandt of Wild Wind Images LLC discusses all aspects of watercraft-based wildlife photography including the advantages of shooting from a boat, choosing the right boat for photography and tips and strategies for better photo results. John illustrates his presentation with his own stunning images, many which have appeared in his nationally distributed calendars. This non-technical presentation will benefit photographers of all skill levels as well as anyone who simply enjoys viewing amazing wildlife images. 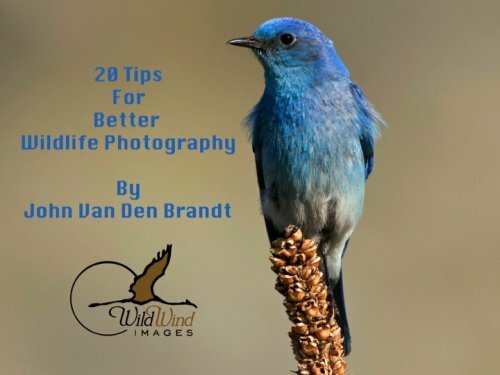 Whether you’re a serious photographer or a novice point and shooter, John Van Den Brandt of Wild Wind images LLC can help you take your wildlife photography from bland to grand. 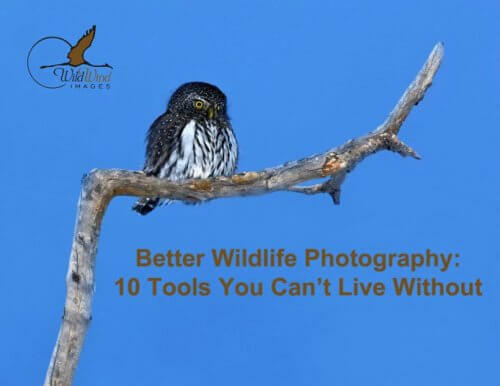 This new presentation is packed with tips that will immediately improve your wildlife shots. From image conceptualization to field tactics, this seminar will help you become a more fluid and instinctive wildlife photographer. John’s presentations are known for their solid, practical information, humor and of course, breathtaking images. Tired of hearing the same old basic tips in photography lectures? 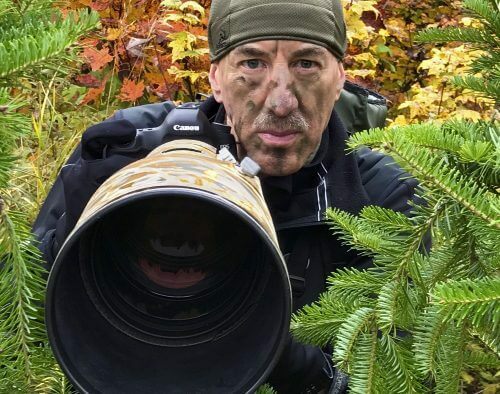 Join professional wildlife photographer John Van Den Brandt of Wild Wind Images LLC as he shares his photography strategies, ranging from equipment and preparation to real-world field tactics for spotting and stalking wildlife on your next adventure. Van Den Brandt illustrates this presentation with his incredible wildlife images, many of which have appeared in his nationally distributed calendars. Wildlife photographers need more than camera gear to get their jobs done. John Van Den Brandt of Wild Wind Images LLC demonstrates ten tools he relies on to get in front of wildlife faster and more often. All of these gadgets are affordable, easy to use and have proven results. You’re sure to pick up some “tricks of the trade” for viewing and photographing wildlife in this presentation.